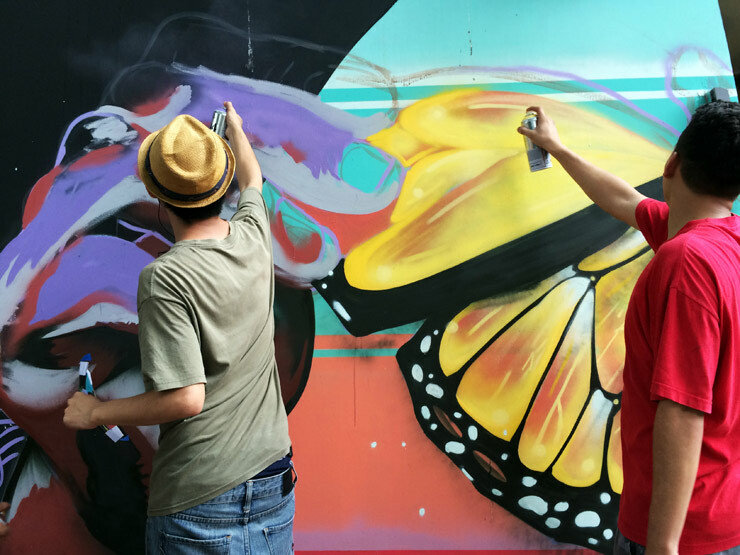 Six street artists took their social engagement a step further in El Salvador last month and taught youth some serious skills from the street. 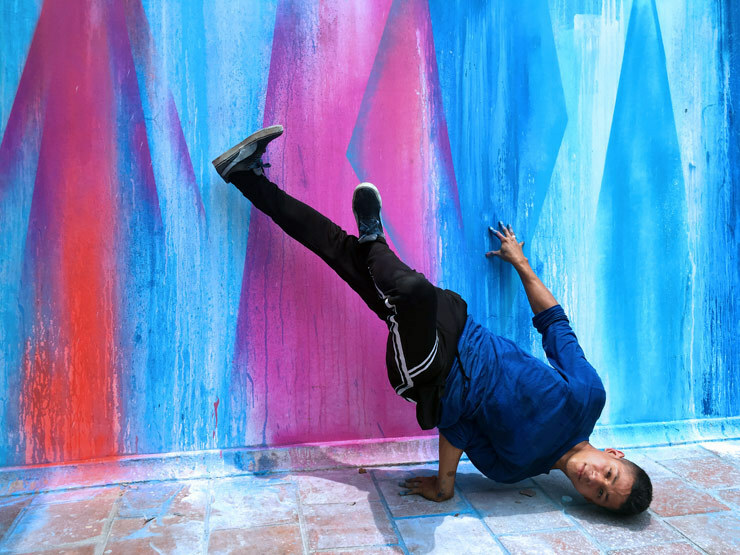 Coming from Brazil, Australia, Ecuador, Mexico, New York and New Jersey, this international crew took the time to share and teach about painting, art, and how community can be built. The program Conect-Arte is a newly launched initiative by the United Nations World Food Programme, which as the name suggests, is also in the city to address a more core need to battle food insecurity. With Conect-Arte the goal is to meet youth in some communities and help with positive role models and options with an eye on transforming lives through developing art and related creative skills that can provide income and channel energy in ways productive to community. Together the artists worked on projects with 45 teens and younger kids over the course of the a week-long workshop in San Salvador, teaching street art techniques like stencil, lettering, mural painting, sculpture, even hot air balloon making. The goals are huge, like reducing violence, food insecurity, increasing access to economic opportunity. The tools here are art, the creative spirit, and strengthening relationships. We bring you some images of the works that were made by the visiting artists and some of their observations and experiences during the Conect-Arte program. 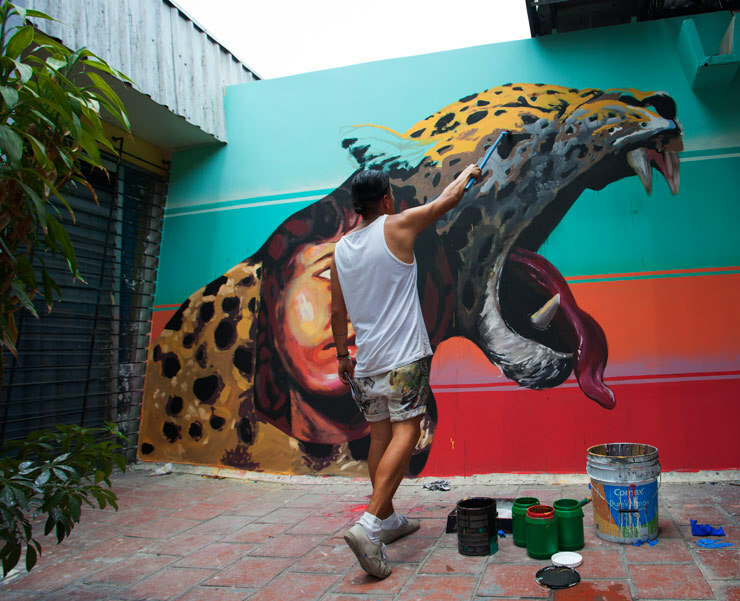 For her large mural project, street artist Vexta referenced the national bird, the Talapo, but creating two together in "Todos Estamos Conectados". 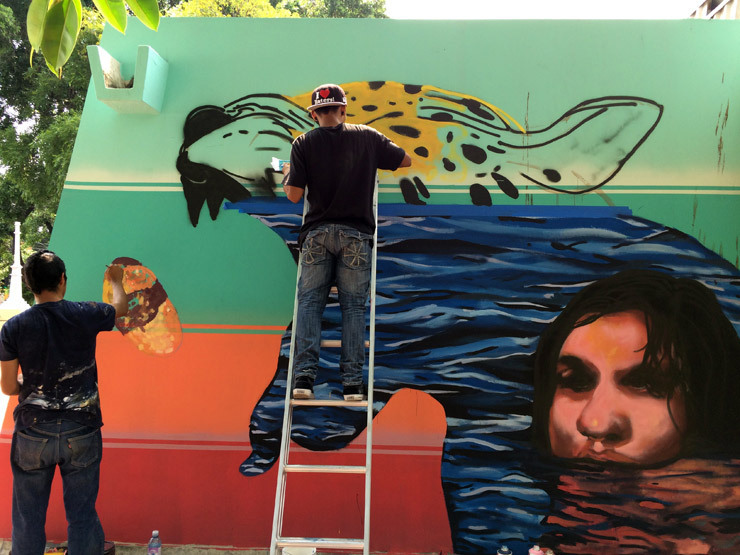 She says it is a reflection mural of this now endangered species at the entrance of a nascent community center called Teatro Camara Roque Dalton. 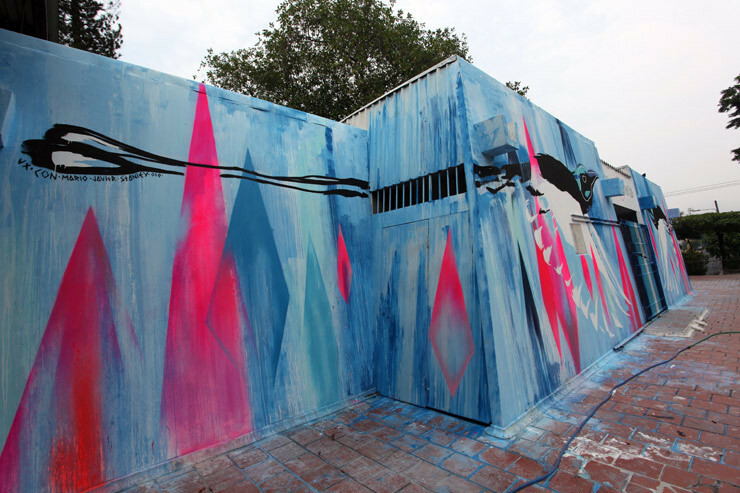 During her installation she worked with three students and they experimented with abstract painting techniques, washes, spray paint, stencils and colour theory. Brooklyn Street Art: How can a project like this help people feel connected to their city and their neighbors? Vexta: This is a great question. In San Salvador there are very physical divisions that are highly visible - tall concrete fences topped with razor wire and the favela type neighborhoods which are often gang controlled territories. So people are really disconnected. 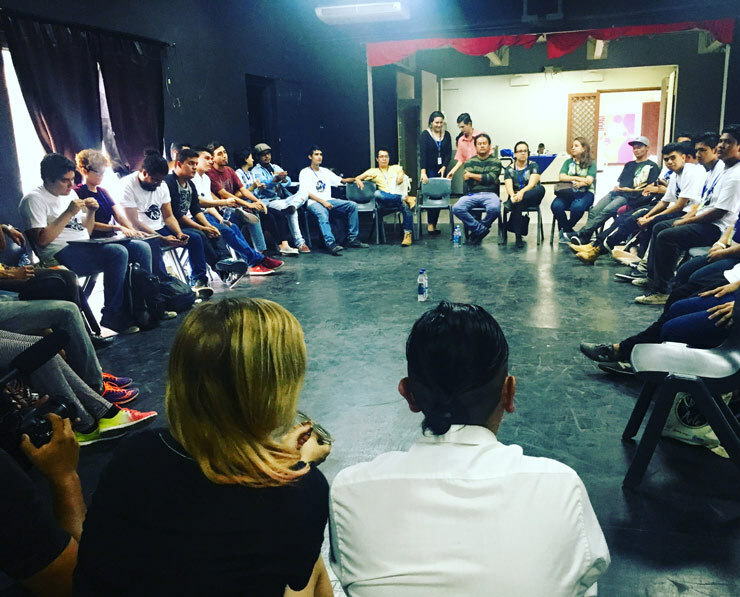 Conect-Arte enabled two groups of young people to come together from two distinct neighborhood areas - The Historic Centre and San Jacinto. The young people in the workshops got to connect with other young people that they wouldn't have met otherwise, new friends were made and skills shared. This was super beautiful to see. 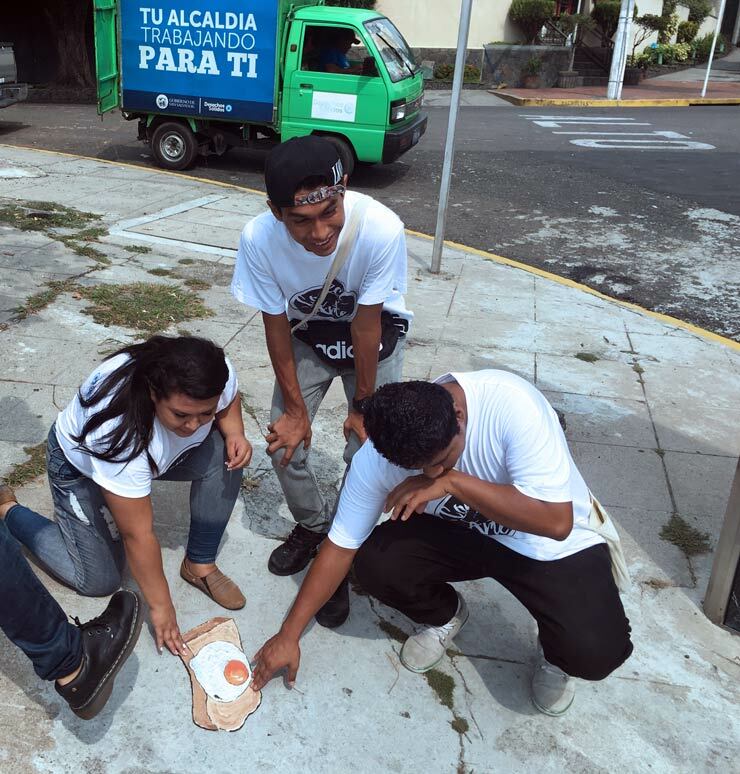 Its really hard for young people in San Salvador who live in poorer neighborhoods to move about the city. The threat of gang and police violence is very real. 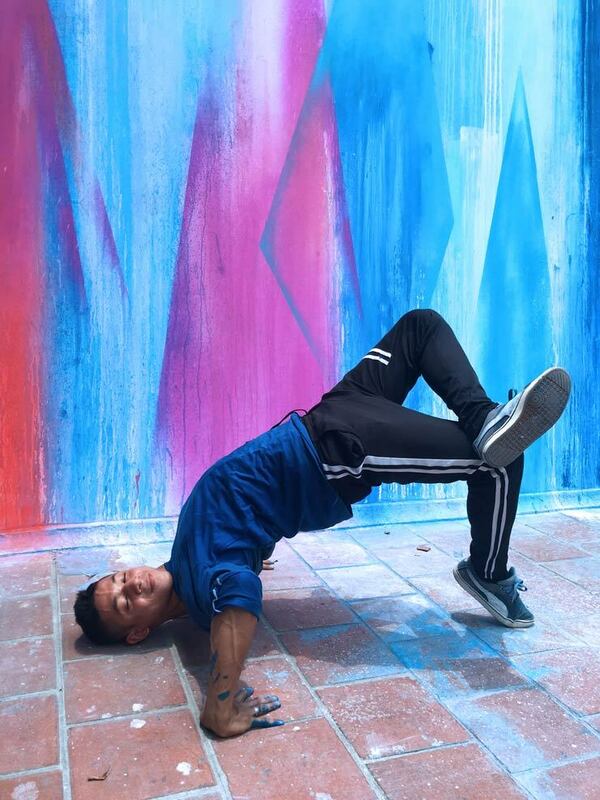 My group in particular made plans to stay in touch, to make more art together and start break-dancing together. 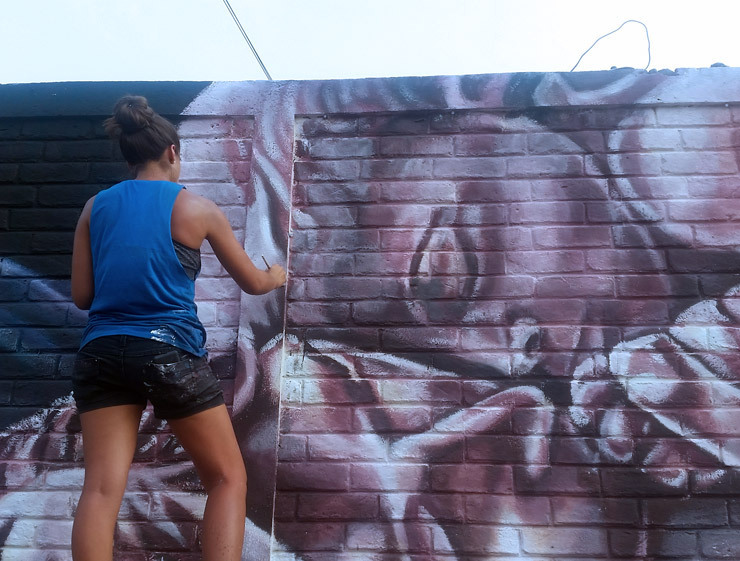 Whilst I was painting at Roque Dalton I had quite a few local people come to thank me for creating something beautiful in their neighborhood, and especially within the historic centre which is an area that is quite neglected, rundown and old. I think art in the streets can provide people with something they can feel proud of, a focal point or new memory site that is not an advertisement billboard or an architectural symbol - which is how we usually navigate modern cities. This time they can say "I live near the twin birds that were painted for me" instead of "I live by the Mister Donut." I hope my piece can bring a sense of the joy for life in a place struggling to remember what the value of life is. To me when you are seeing people approach the building to spend time taking photos of themselves and their friends and family, actively engaging with the art, is proof of a very real connection occurring between people and their city. Brooklyn Street Art: Is it difficult to try to represent poetry visually? LNY: It could be difficult yes but to me it became a matter of reacting to the poetry as opposed to try to represent it literally - which is the same way that I approach making context-sensitive art or murals. The poem was a starting point for our conversation and it helped inspire ideas, images, a mood and an internal narrative for the mural. We reacted to the poem the way dancing is a reaction to music, but we were not bound by a literal representation of the poem. 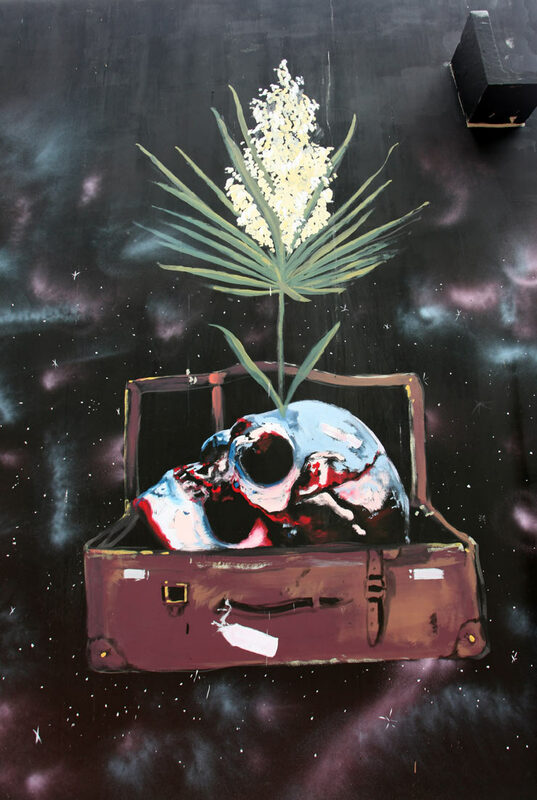 An average person can encounter a mural or a poem and, without context, have an interpretation that is very different from what the author intended. Do you ever feel like you want to leave an explanation near your artwork so a passerby can understand it better? Art has the power and range of a self contained language, one that works just like a written one but benefits from not being attached to a particular official language, nation or culture. See, I find myself traveling to lands where I do not speak the local language, be it literally or the proper vernacular, but by making art I get to bridge that gap and communicate regardless - the universal language of art allows me to communicate beyond English or Spanish or what have you. So that's one thing, art can fully explain itself as a visual language. Then you have the problem of interpretation which I, as an artist, will never fully control so let's not go there. Lastly, and what I think becomes really interesting, is the idea of audience as far as an explanation would go. My answer was to somehow take an interpretation of a poem and turn it into something new and visual that you can now read as a mural, as its own thing, as an experience with its own language -- as a new and self contained visual poem. 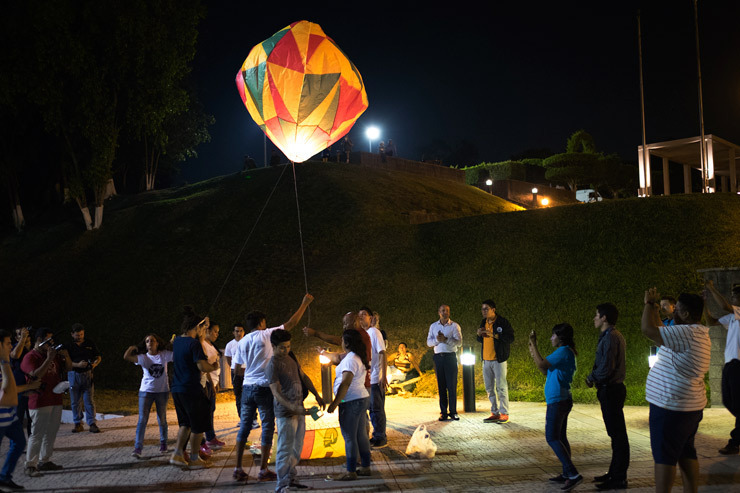 In descriptions of the project the subject of safety in San Salvador comes up frequently, with stories of youth and families restricted to safe zones behind walls, fences, barbed wire for fear of violence from gangs and heavy handed authorities. 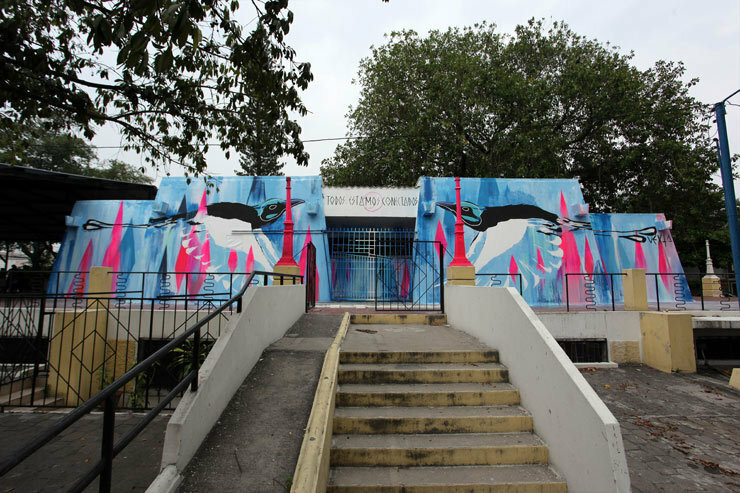 Mexican Street Artist Paola Delfin created her piece entitled "Tu eres yo¨/ ¨You are me" in one of these protected neighborhoods. 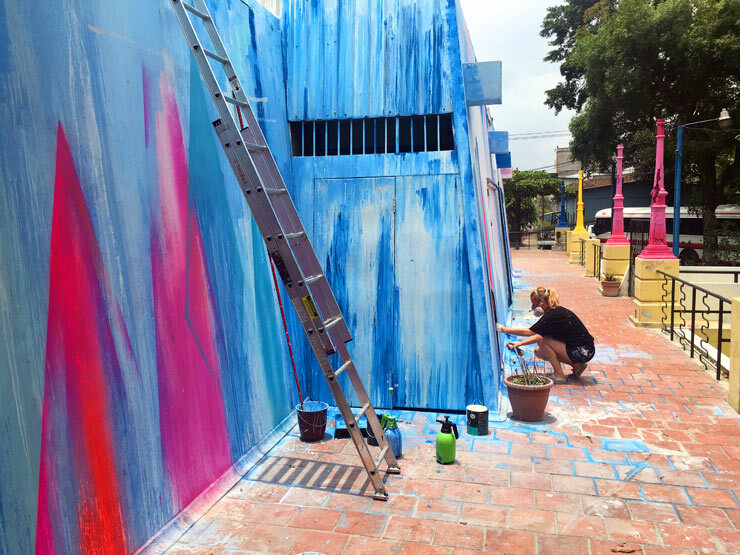 She says in the group's press release " This wall is inspired by many factors, after finding out a bit about the area where the wall is situated -- a neighborhood consider safe in San Salvador. El Salvador is a country that a lot of people think of as a really wild place, but you can also find so many pretty things and beautiful people, this wall for example is the facade of ¨La Casa Tomada¨ a really inspiring place where many young people get together to create and learn from each other about art, music, media and many things." 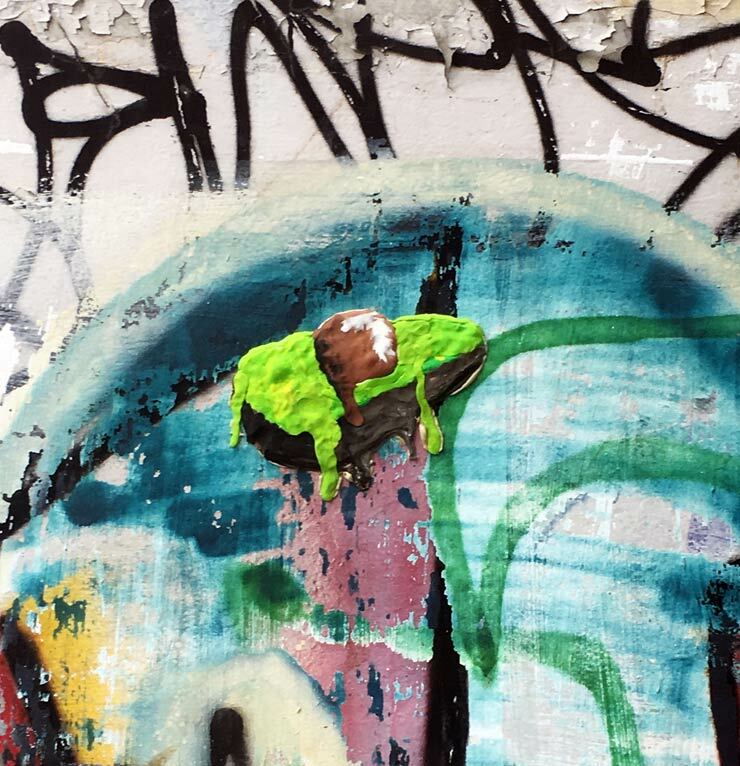 Brooklyn Street Art: Does San Salvador have a particular personality on the street? 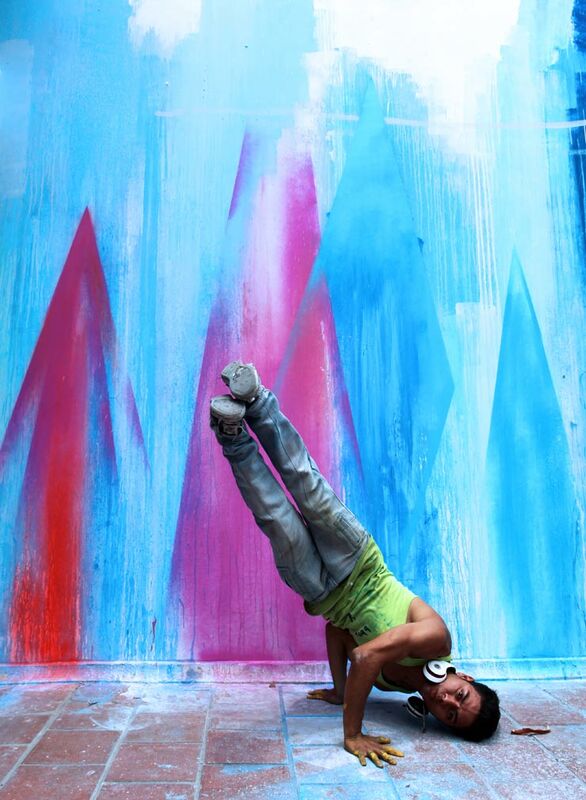 How does an artist effectively speak to that audience on the street with their work? Paola Delfin: Unfortunately I didn't have much time to check out a lot of places around San Salvador, but I felt really related to it. I felt it looks pretty similar to Mexico, and I think the contrasts you can find there are pretty similar as well. I think not only the Salvadorian audience but a lot of people from nearby countries (even my own) expect to communicate their thoughts and concerns about a lot of situations that are happening. I guess that we as artists have to find the way to share their thoughts and try to focus on the impact that our own thoughts could have on the people who see our work. 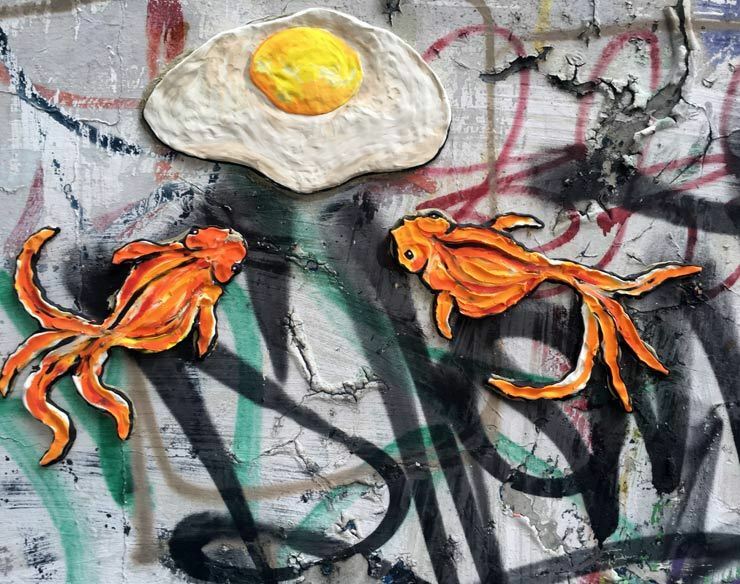 Street Artist Mr Toll created a number of food related sculptural pieces in reference to the food scarcity issue in his work with the youth. Twisting the name of his project, he literally was making "Street Food" (Comida Callejera). 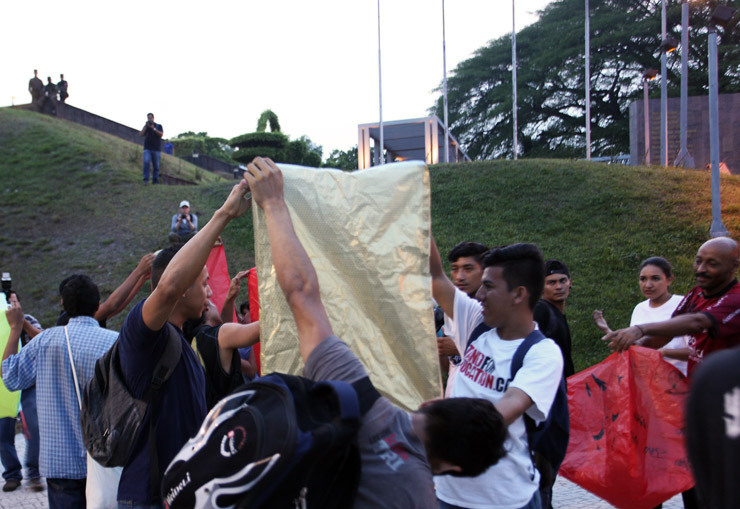 He is quoted in the group's press release saying, "One of the major concerns in San Salvador is Food Security. This inspired my workshop and subsequent Street Sculpture collaborations with the students. 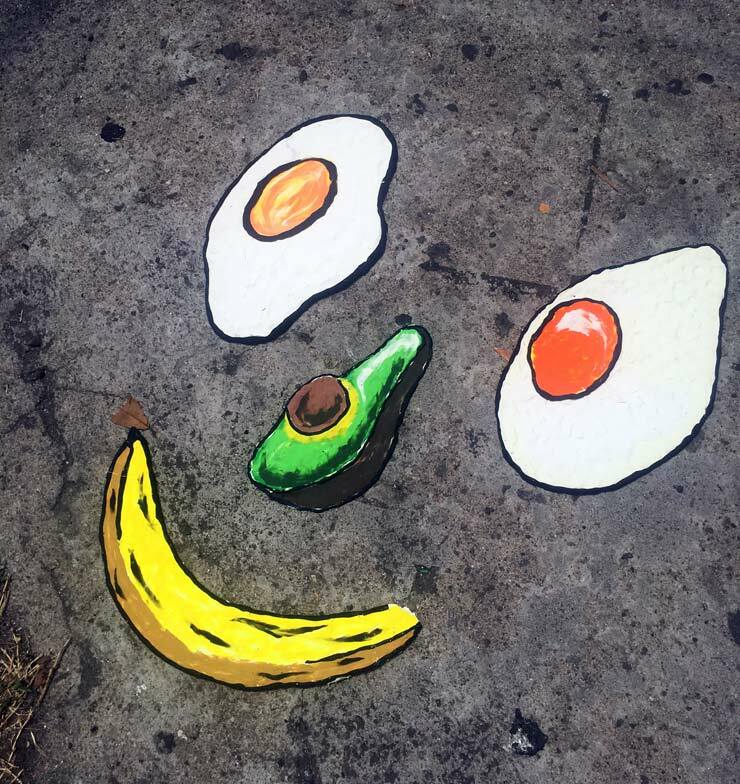 During the workshops we focused on the healthy everyday foods the youth come in contact with, we discussed different issues while preparing the sculptures and then brought them together on the street as food face collages," obviously injecting a brand of comedy that the kids could appreciate. 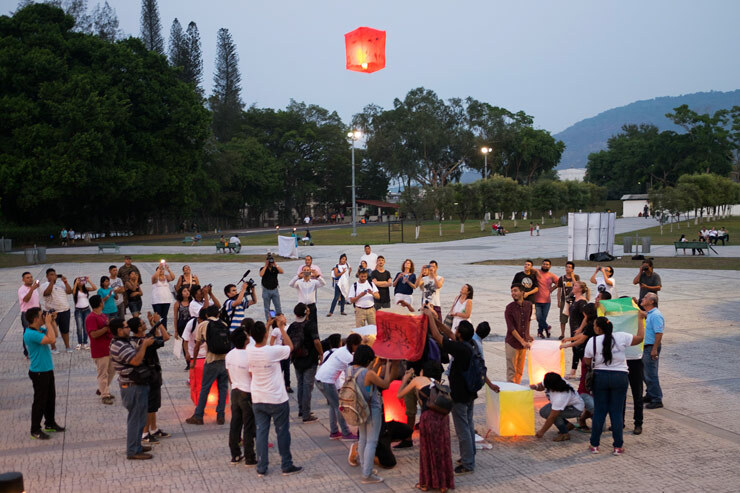 "The opportunity of working directly on the street as a group gave the youth the freedom to play, experiment and feel safe in a public domain which generally they don't have access too," he says. "They face many restrictions due to gang activity and a heavy handed police presence in San Salvador. It was important for me to help to bring a little fun and humor in a creative way to their lives in a city faced with many difficulties." Adapted from the original Chinese hot air balloons, artesian balloons have had many cultures artistic influences in the last century. Brazilian Street Artist Claudio Ethos and members of the Sao Paulo based graffiti crew called 14 B.I.S crew (Sao Paulo) had a workshop promoting the art form by teaching how to make them. Called locally by the name of Globos, the project involved elements of mathematics, physics and geometry as well as a very necessary requirement of collaboration. Globo Lokos was the project name and working together with the youth was especially rewarding because of the airborne result of their collaborative efforts. 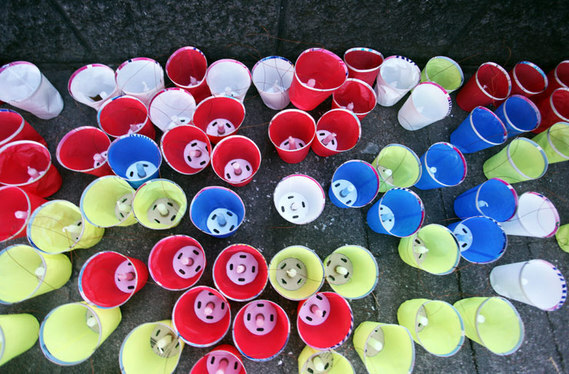 "The focus," says Ethos, "was start to finish object making, where the young people had the opportunity to show their city, where they live, that they can make art and be artists. 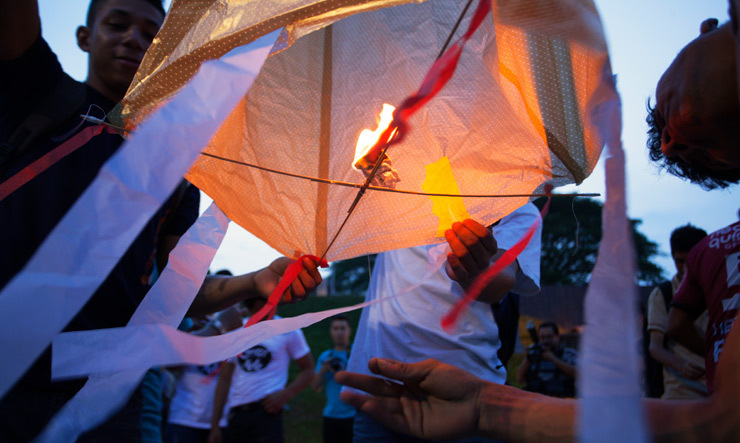 We helped the youth to make the balloons drawn with art to send their prays and wishes to the sky, Then they launched their works of art into the sky, which is a very powerful action," according to the press release.